New head coach Bucco Bruce Arians has studied Tampa Bay personnel since signing his four-year contract to lead Tampa Bay, and it seems pending free agent QB Ryan Fitzpatrick might be welcomed back with open arms. Arians was chatting on CBS Sports Radio last week and Joe got the feeling Arians believes he can coach the stink out of Fitzpatrick. Co-host Brandon Tierney teed up Arians with a question about Fitzpatrick and Arians didn’t respond with a vanilla take about still evaluating the QBs behind Jameis Winston. Brandon Tierney: Fitzpatrick’s not a bad guy to have in that quarterback room. He’s been around. He’s smart. He’s put up some points. He’ll be an asset, right? Bruce Arians: Oh, there’s no doubt. You know, Fitz, he’s been doing it a long time. He’s one of the streakiest guys I’ve every played against. And so it’s a very interesting [quarterback] room. It’s an interesting situation. Fitzpatrick clearly has a lot of talent, but also has longstanding mental issues when it comes to his on-field play. Just ask Todd Bowles. 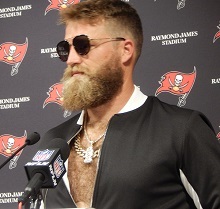 Arians, though, is the quarterback whisperer and might think Fitzpatrick is the perfect fit behind Jameis, where Fitz would have been if Jameis didn’t act like a fool on a March night nearly three years ago. Joe has no problem with Fitzpatrick being a modestly paid backup, though Joe would much prefer the Bucs find a more long-term solution at the position. And no, that’s not Ryan Griffin. I don’t get it Joe. Jameis completes 65% of his passes, throws for 19 TDs with 14 INTs in 9 games and he’s still ‘America’s QB’ Fitz completes 67% of his passes, throws for 17 TDs with 12 INTs in 7 games and you get the feeling that Coach Arians thinks that he “can coach the stink” out of him. I thought just a few weeks ago lots of folks were saying Jameis doesn’t need to be ‘looking over his shoulder’ to see if someone is gonna take his job if he can’t git er done. Starting to wonder if this little thingie called REALITY isn’t setting in around 1 Buc Palace. he is doing nothing more than saying the right thing. There is no doubt he has no idea what they will be doing at back up right now. You can rest assured the back up will be there for just that a back up for injury. Arians is smart. He know he MUST have a backup plan since Winston is who he is. Joe, Winston has shown you MANY times who he is…..believe him. Fitz’s first couple of games were something special but I agree with Joe that we need a more long term solution at backup for slightly different reasons. IMO it would be foolish to not have a backup capable of stringing together a bunch of victories together. Nobody knows what the future holds in the NFl ,injuries have ended promising careers or put them on hold while they rehabbed from injuries. There are still questions surrounding Ryan Griffin on whether he can take the pounding of regular season football since he hasn’t done it yet and was injured in training camp a couple of years ago. We need to draft a QB with the idea that they may be the starter one day.Anything else would be all to similar to the shortsighted, stopgap attempts that Licht has shown don’t improve the roster. Fitz has a better NFL win record and Buc win record than Winston. He gave the Bucs a terrific 2-0 start last season, beating the both Eagles and Saints; most commentators thought these games unwinnable. In doing so, set some NFL records and was twice named NFL Offensive Player of the Week. Gave Bucs fans some badly needed hope. He’s had some bad games, but so has Winston, yet the “stink” is all on Fitz?? I am so tired of this ‘Quarterback Whisperer’ garbage. Just because Arians had a brief influence on certain QBs in the past does not mean he made them great. In truth, he has not proven anything with this team yet, and his mouth has done little but talk a big game or send up red flags. When Lovie became HC, it was clear he was in charge and it turned out horrible. Arians seems to have even more power than Lovie did. And people criticized Koetter for blind loyalty, but Arians is twenty times worse. Or does anyone here think that if Bowles does a bad job, Arians will fire him? I sure don’t. I think Arians would announce his retirement before he fires his friends. All this ‘coolness’ being pushed in our faces feels like we have a used car salesman coaching the team. Maybe I wouldn’t feel this way if I didn’t have it magnified by the media, but right now it has a ‘too good to be true’ vibe. With every new coach we’re given an overhyped presentation to fire us up and buy tickets, then things go bad. I’m tired of it. I know I’m not the only one who feels this way. I’m sick of being told I’ll get one thing, and then getting another. Fitz is a good backup for us, we should keep him. Fitzpatrick is a good guy, but I want him gone. Not because of some falsely perceived threat to Winston. But rather, because a backup should have long term potential to be good or great. That’s how it is with every other position, that’s how it should be with QB. Even if Winston explodes this year, we need a backup who can gain trade value. OR, if Winston busts, we need a serious consideration to potentially replace him. Same thing with Gerald McCoy. I’m all for keeping him, especially under a new deal if it happens, but now is the time to find his replacement, because he’s not going to last more than 2-3 more years for us. A fresh draft pick needs time to acclimate. The Patriots are great because they plan ahead. Simple question: If we are playing in the Superbowl next year and Winston goes down in the first Quarter, can Fitz with the ring for us? Why are some worried about long time solution for the backup qb position???? The “real” fans would much prefer the Bucs find a more long-term solution at the starting QB position!!!!!!!!!!!! The 2019 season will reveal answers to the sheep that the “real” fans already know!!!!!!!!!!!!!!!!!!! It seems to me that Arians doesn’t want to badmouth any player at this point…..he has said positive things about everyone including Djax. As for Fitz…..that reminds me. For all of you wanting us to go out and get some great FAs…..Our cap space situation is terrible. At this stage we still have a WR, LT, MLB, K & Backup QB unsigned along with the entire 2019 draft class……not a very good situation at all. Spot on observation into the twisted reality that Joe and JW worshippers seem to live in. I agree. And Jameis has that potential. He’s young, he had team record production his first three years, and he’s matured a lot off the field over the past three years. If Arians can take him the next step, Winston can become elite. Its a trick question!!!!! The answer is, that it does not matter because you will wake up when the alarm clock goes off!!!!! Now stop dreaming and get back to reality!!!!!!!!!!!!!!! The 2019 season will reveal answers to the sheep that the “real” fans already know!!!!!!!!!!!!!!!!!! The Bucs win and Jameis is a super hero and Jameis deserves the credit . A simple pass by Jameis is termed a “laser”. Fitzpatrick sets a record for consecutive three 400 yd games and 3 / 4 td games and it’s , he is a journeyman and implies this lucky streak will end soon. (Which it did ). Fitzpatrick throws the same interceptions and only scores just 3 points in a game just like Jameis and it’s a montrocity . How can coaches allow this to happen. As a result of benching , Koetter now gets name called. And cannot get out of town quick enough. I honestly don’t think fitz should be back. Apparently , he got in Jameis head and that is a big no no here. Any who thinks Jay-Miss is going to blossom into something he hasn’t been is only fooling themselves. This team needs Jay-Miss to do more than “cut down on interceptions and turnovers a little bit.” He is not a future top 10 QB in the NFL. Jamies cutting down on his turnovers is a good start. Now he needs to start working on that muscle between his ears. He’s fine in the first half when the coaches offensive game plan works, but then we defenses adjust in the second half, Jamies can’t process new information fast enough to make good decisions. As fans we should absolutely pray that Arians magically turns Jameis around, but from all the evidence we seen I’m not sure that is a likely outcome. I agree ,that should be the strategy. You never know whether you are gonna get a RG3 or a Kirk Cousins. Lack of competition at every position is a huge mistake. Licht has shown a lack of planning for the future with his picks , He has to be prepared when one fails or is injured. Wow TBBF, you are an optimist. Our salary CAP situation is well BEYOND terrible IMO. Bucs NEED to sign a LOT more starters & key rotational players than those 5 if we expect to compete in the NFC South this year (some veteran FAs & hopefully some from the draft). I’d ADD 2 RBs for starters, plus 1 RG, 1 RT, 1 DT, 1 DE, another LB, 1 outside CB & 1 safety to your list AS A MINIMUM. That’s 12 new starters & key rotational players MINIMUM IMO. And we have to pull that off with at the most $50 mil in CAP space (assuming we renegotiate some contracts AND release/trade some players). A starting LT will set us back $14-$15 mil or so. A slot WR probably $5-$7 mil. A starting MLB around $5 mil, and a starting outside CB probably $7-$8 mil at least. Throw in $3 mil for a decent Kicker plus $5 mil for a starting Safety & $4-$5 mil for a quality RB (to complement Barber) and we’d be at the $50 figure already … with more holes yet to fill UNLESS we can get at least 2-3 starters out of our draft class. Piece of cake … Super Bowl here we come! We’ve barely seen Ryan G.. but yes, let me trust all the coaches who have come into this mess and left….def trust their opinion….right. The media keeps us focused on Jameis, BUT … he’s really the LEAST of our problems at this point. Unless the Bucs dramatically improve our OLine & RBs, and oh ya our DEFENSE, this offense will perform essentially the same as it has the last 2 years. Give Jameis better pass protection & a running game, and he’ll be GOOD ENOUGH (may even turn out to be a real America’s QB, who knows at this point). Improving the DEFENSE, even to just a middle-of-the-pack defense, will almost certainly add 3-4 wins to our season over what we’ve been seeing. Only time will tell whether or not we can pull that off however. Jameis is the focus of the attention but he is not the problem……..the running game/Oline…..and the entire defense is the problem. It’s so much simpler to blame everything on the QB…..but we have some work to do to give him the support to succeed. Fitz is a great backup to have on the team. I can see Fitz becoming a QB coach down the line when he retires. A very smart guy. if dirk did his job, we wouldnt be in this situation!!!!!!!!! dirk put us in a hole and smitty damn near covered it up with his lousy defense!!!!!!!!!! now you’ll have to sit back and watch “real” coaches win with dirk’s players!!!!!! You guys are ridiculous. All he did was say something good about a QB he has respect for.If you really think he is tipping his hand, “showing a chink in the armor” or anything other than saying the right stuff, you have a serious problem with rational thinking. he said, Simple question: If we are playing in the Superbowl next year and Winston goes down in the first Quarter, can Fitz with the ring for us? Yes, simply Fitz has proven he can step in and play well in short spurts. It’s when he starts to stack games he begins to falter. Superbowl !!! with JW !!!! !.Wow two -three weeks make big different among some of the bucs fans. We never going to super bowl with him……never. is not meter of optimism, is common sense, records, and facts. You folks still on the Fitz jameis argument.. open ur freaking eyes. Winston is a star. Fitz is mediocrity. He has to go. If not, Jameis will always have that intrusive thought of “he might take my job” somewhere in his mind. Really.. did Rodgers, Manning, Brady, Brees, Roethlisberger, Ryan, Lock…..’have intrusive thought’, why he is been treated as breaking glass “primadonna”…..need protection, support…… BS…. he is great ONLY on FSU fans, period. Everyone gets a new playbook. Both quarterbacks are supposed to be pretty bright but, the first time #3 learned an NFL playbook, his back-up wasn’t an experienced, Harvard-grad. BA’s system is supposed to be even more complex than Dirks. Since the Bucs seem to want to protect #3 from any exterior pressure (competition), I hope this fact doesn’t put undo stress on #3’s seemingly fragile psyche.